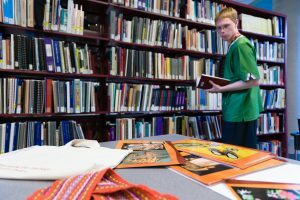 Xwi7xwa Library offers select Library, Archival, and Information Studies students and Library & Information Technology diploma students experiences in Indigenous Librarianship. These experiences are offered on a limited basis as our staff capacity and resources permit. This page outlines the types of opportunities that might be available and where to find more information. Working at Xwi7xwa gives student librarians and archivists a hands-on experience with a wide range of professional activities working closely with librarians and staff. *Contact the Head Librarian to pitch a volunteer project idea or area of interest. If the pitch is found to serve the mission of the library and sufficient capacity exists within the library to supervise the student, a work plan to satisfy the academic requirements for those experiences may be co-developed. Xwi7xwa librarians and support staff are available on a limited basis to assist students investigating aspects of the professional library experience as part of their coursework. Please contact us in advance by email to make an appointment. Staff and librarian interviews used for any publications beyond a course paper submitted for class grades will be expected to have BREB research ethics approval. Library & Information Technology diploma students who would like a behind-the-scenes tour to give an idea of the range of duties undertaken by library support staff at Xwi7xwa or an interview for details on public or technical services should contact the library. Xwi7xwa regrets that it cannot offer paid positions or unpaid practicum placements to diploma students.